The strategy game genre is full of variety in both the computer and on the table top. However, it’s not often we see a combination of one from each in a single package. 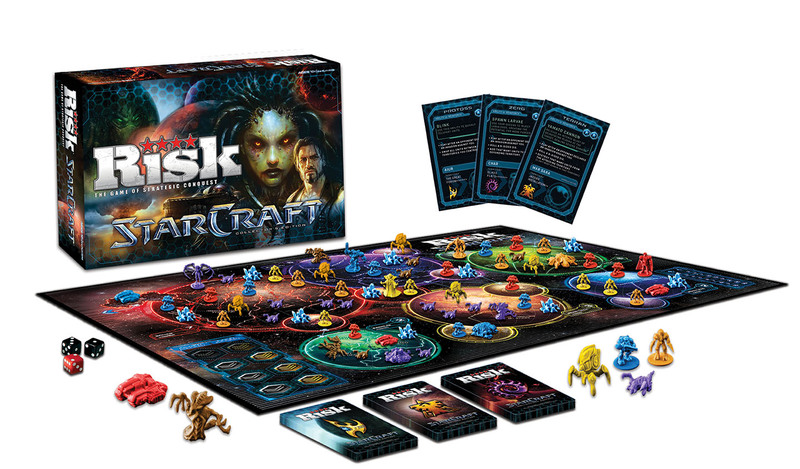 That’s exactly what Risk StarCraft is, an adaptation of a famous computer game franchise into a known board game franchise. 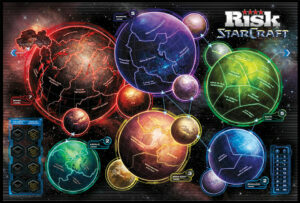 Risk has had many other variations and adaptations over the years, and this one is produced by USAopoly to combine the lore of Blizzard Entertainment’s StarCraft universe with the tabletop strategy gameplay of Risk. It was released on October 10, 2012, and makes use of both the classic StarCraft and the newer StarCraft II settings, which had already been out for two years prior to the board game’s release. Adapting the computer strategy game Risk StarCraft into a board game may seem novel, but mashing it up with Risk seems like an interesting concept. Risk: StarCraft is playable for 2-6 players and has three different play modes, so you can choose who you and your friends want to play it. Multiple play modes aren’t very common in board games, so this one does win out in terms of innovation and variety. Like in the computer game, you can choose one of 3 races — Terran, Protoss, and Zerg. Each has their own strengths and weaknesses, which should be well known Risk StarCraft fans. Terran is the human race with guns and flying buildings, the Protoss are the super-intelligent alien race with psionics and warp-in technology, and the Zerg are the insect-like race like in Alien and Starship Troopers that multiply like bacteria and overwhelm enemies with numbers. While most of its mechanics are based on classic Risk, these changes, and augmentations are meant to accommodate and emulate the complexities of the strategic gameplay of StarCraft. Instead of the countries and continents in classic Risk, you have worlds on the map, each with their own sectors that you must conquer to win the game. There are mineral fields that you can acquire for rewards, which can help you get ahead. Each race has two hero units to choose from, which were taken from StarCraft II. There’s Jim Raynor and Valerian Mengsk for the Terrans, Artanis and Zeratul for the Protoss, and Kerrigan and Zagara for the Zerg. Each hero unit has a unique ability that makes him/her stronger and affects the board more than regular units. Playing this game is more of a juggling act than it is in classic Risk, which is how the computer game plays as well. This multitasking is what adds another dimension to this game, so its selling point is not merely about the far-out science fiction setting that happens to be similar to a computer game. But then again, the thematic visuals and designs are still pretty cool to have on a board game like this as it compliments the deep strategic gameplay that players have to get into. It does mean that there’s a lot more mechanics to get into, which may get very confusing for beginners. This is a game that’s best for experienced Risk players who have already gotten their heads around the basic rules and mechanics of the original game. There are also a few little niggles like how the mineral fields are placed randomly throughout the board, so there’s no definite strategy to getting them. There’s also something with the team colors, especially with the Protoss ones where the yellow and orange units look the same. As for the good things, it does play well as a Risk game. The game worlds on the board are different, with some having fewer entry points than others, so you can definitely come up with strategies that can help you win. There are worlds that are easier to lose than others, so the “risk” factor in conquering territories is certainly there. There are also other achievements and rewards to go for while conquering worlds and fending off other players, and things can get pretty wild if you have 6 players fighting all over the board. With the material, aside from the problem with the colors, the unit pieces have pretty good build quality. The board and cards are well-designed and easy enough to read, as well as big enough to be able to get a hold of while not taking too much space on the table. The look and feel that comes from the StarCraft theme give the game its own unique flavor that can be quite attractive. Even if you may not like this version of Risk as you do with the others, it still looks good enough to be a must-have for Risk collectors and enthusiasts. 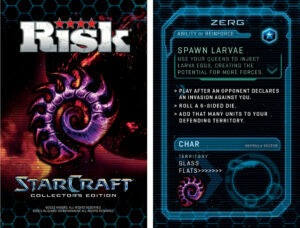 If you want a Risk game that is a bit different, then you should give Risk StarCraft a try. The game can also go for StarCraft players who want a bit of a break while still getting into something that’s still related to Risk StarCraft and strategy gaming. It may not be that perfect, but it’s a good mash-up of two popular strategy game franchises that tabletop gamers can enjoy on their gaming nights.